It's been a long time in the making, but now it's finally here. ManGlaze has released their newest shade: Mayonnaise. 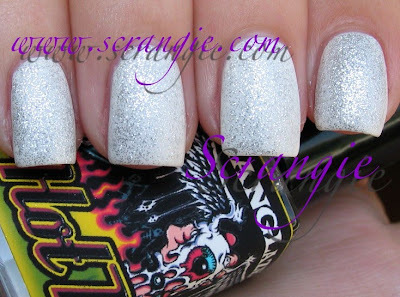 Over a year ago ManGlaze sent some of us a teaser picture of a white matte prototype topped with some silver glitter and it looked amazing. Now I can see it with my own eyes. I like. ManGlaze Mayonnaise. It's a matte white- a nice clean matte white without yellow tones in it like actual mayonnaise would have. It has a slight pearlescence to it to keep it from looking like pure white-out. One coat of Hot Mess over three coats of Mayonnaise. The formula on this was pretty good. If it were normal polish I'd probably say it was too thick, but since it's a matte it has a different set of standards for me. I didn't have any trouble with application- it was thick but not unmanageable. Since it's white it can get streaky and that's why I did three coats. As long as you have plenty of polish on the brush and never let the brush or nail get too dry while applying you won't have a problem. It was easier to apply than KO White which is the only matte white I can compare it to. Not as easy as OPI Alpine Snow matte, but that's basically pure white-out so, apples and oranges. The only complaint I have about the formula of Mayonnaise is that it takes a lot longer to dry than Fuggen Ugly or The Death Tar. I wasn't prepared for that and ruined my first manicure. Just give yourself a little extra time with this one. Another thing that seems different about Mayonnaise compared to the other ManGlaze shades is that the bottle is tiny. I don't know if it's a mini or if this is the normal bottle size for this shade. I can't find any info on the size or volume of the bottle online to know for sure. I wasn't expecting such a petite bottle- no Costco industrial sized drum of Mayo here! EDIT: Mini is a mini, the one you'll purchase from the website will be normal sized. Apply basecoat and let it dry COMPLETELY. If it's not completely dry it will cause the polish to crack like those old Cover Girl crackle polishes. Though, you should try it at least once, cause it looks pretty cool. Get a really big bead of polish on your brush- it will seem like too much, but trust me, you'll need it. Apply the polish in a gentle pushing motion, as if you were pushing the bead of polish down your nail instead of a painting motion. If you use Seche Vite topcoat, this is also the same method you'd use to apply that, if that helps you imagine the motion. Don't stop the brush, don't press down hard, don't go over the same spot twice. You want it to be one fluid motion, from cuticle to free edge, for each stroke you need to make to cover the nail. Aim to cover the whole nail in two to three brushstrokes keeping the brush wet at all times (you may need to add more polish to the brush between strokes). It is very important not to press down too hard with the brush. It'll cause streaks and ridges. You want a very light touch and you want the brush to stay very wet. Try to use as few strokes as possible. This will give you a smooth, even, ridge-free matte application. Overall, I'm rather impressed with Mayonnaise. Application was easier than I anticipated. It's not yellowed looking like KO White, but it's also not a stark white-out creme white. It's definitely wearable. It doesn't remind me so much of mayonnaise as it does of royal icing. But, royal icing doesn't sound as nasty as mayonnaise so I don't think that name would have stuck. Good tips on how to apply this one. I think the sparkles remind me of fresh snow the morning after a night snowfall. I love the crisp white. But, the name makes me gag! Man and Mayonnaise... I might need to pick this up for the name alone. Much like my beloved Essie Meet Balls. The name is gross, but the polish is pretty! with t/c "just because" is fantabulous!!!! I just love this and I want to put the combination on again looking at your photos! I don't know why but it appeals to me so much. And the name makes me LOL so hard! The name is so gross lool! But this is an awesome shade. I really like it. The purchasing bottles are all the same size. I'm pretty sure you received a sample bottle. Nice! I really appreciate the matte application tips - I can definitely use all the help I can get when it comes to mattes. Thanks for the information on how to apply matte polish. I don't own any of this brand. One of these days I may buy some. Love the look but the colour name makes me nauseous! I have a huge aversion to mayonnaise lol.